I got a CB-1! Yeehaw! It has the greatest engine sound of any bike ever made -- when you're riding it, it sounds like a GP race a mile away, only you can make the racers go faster or slower, by adjusting the angle of your right wrist. If I had an imaginary bike that would do everything right, this is the real incarnation of it. I've been riding it in my mind for so long that when I met it in the flesh, it was like reincarnation or something. Okay, maybe he was exaggerating a bit. Still, the Little Honda is a neat bike. I added a fairing (the EX500 spoiled me), a Rifle Nightflight. The order took forever and I had to make some modifications to the mounting hardware (it didn't just bolt on) but it looks pretty good and the paint is holding up well. Targa used to make the well-regarded Tsunami, but they've stopped making the CB-1 model. I tried a generic "cafe fairing" from a local bike shop, but it didn't fit -- wanted the headlight to be much higher than it is compared to the turn signals and bars. Though I love the high revving nature of the engine, buzzing at 8k RPM on the freeway got to me, so I installed a 35 tooth rear sprocket (6 teeth fewer than stock, but my 150/60 rear tire is a little smaller than stock, so the net is about 14% higher gearing). I had to take a pair of links off the chain. I still get good acceleration in lower gears and it's still a high-revving bike, but it's a lot more livable on the freeway commuting to work. Gets better mpg, too, though of course the gauges are off now. 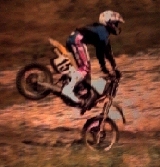 It's very cool to have a bike that can take radial tires. They're unbelievably forgiving compared to the bias ply tires I had to run on the EX500. The spring latch under the key lock releases a catch that fits into a notch in a post near the back of the seat. So pull the seat straight up (if necessary, pushing a little toward the right side of the bike) to release this post. After that, the spring catch should no longer be needed. Now two catches around the middle of the seat need to go straight back, while the front of the seat needs to come out from under the tab at the front, and an inch or two behind that, the seat needs to slide diagonally up and back. 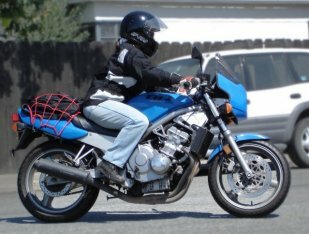 Alternately, sometimes it works to grasp the back of the seat with one hand, the front with the other, and apply upward pressure on both ends while also pushing toward the back of the bike. I wrote an article on modifications I've tried to the EX500 -- what worked, what didn't. 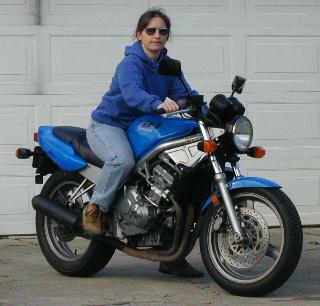 Before I got the EX500, I had an RD400. 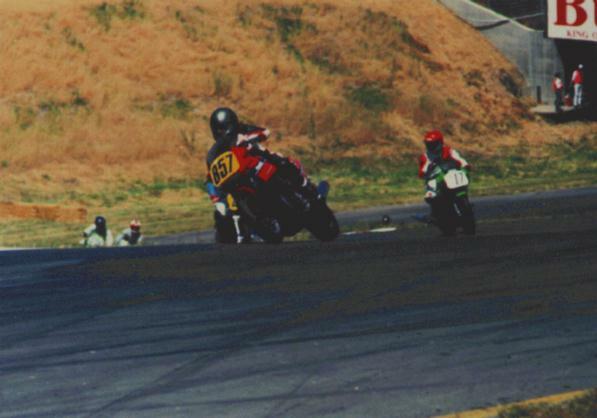 I never managed to keep it running for long enough to learn much about riding, though. A theoretically cool bike that didn't work out too well in practice. 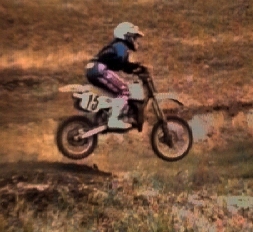 Dirt biking: I tried a '82 XR200R as my first dirt bike, but I didn't get along with it very well. Lots of people like them, but it didn't suit my size or style, so I started hunting for something smaller, lighter, and quicker. 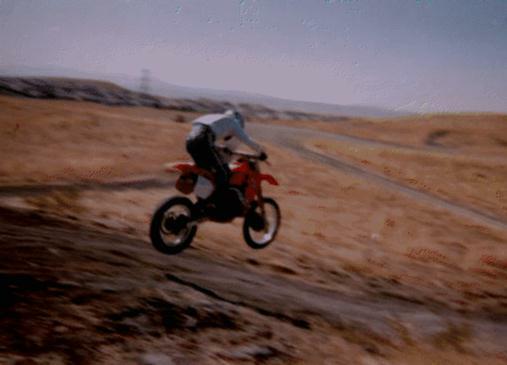 Here's a short article I wrote on my search for the perfect small dirt bike. 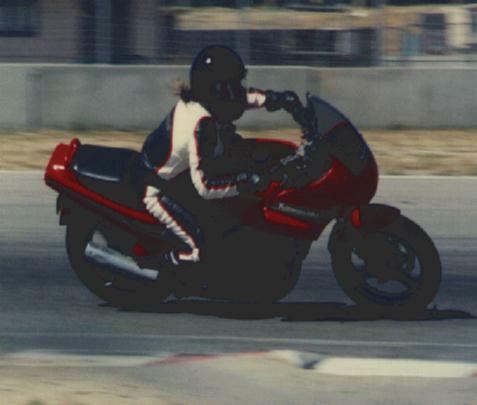 Eventually, I found a '91 Suzuki RM80, "Zodiac". 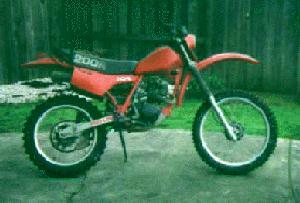 I sold the XR200 to Rick Gould, after he sold his CR500. Back to Akkana's Home Page. Home of the Short Bikers for information about the SBL mailing list, other short bikers, etc.